The Roto Grip 2 Ball All-Star Edition Carryall Tote Red/White/Black holds up to 2 balls, a pair of men's size 13 shoes, plus accessories. This bag has straps for carrying as a tote plus all the features of this bag are perfect for the bowling tournament traveler. Dimensions: W:16" x D:10" x H:14"
Unfortunately, this bag does not have wheels. 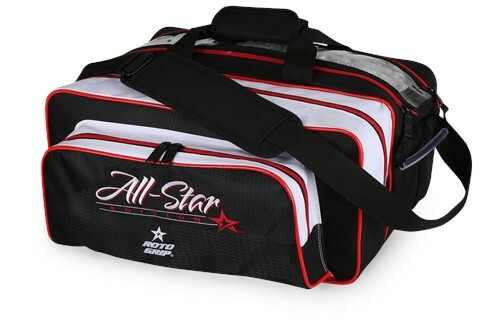 Due to the time it takes to produce the Roto Grip 2 Ball All-Star Edition Carryall Tote ball it will ship in immediately. We cannot ship this ball outside the United States.